The Fourth » Stairway to heaven? Finally, we’re out of the land of orange. Fun fact: the music of the endless stairway uses an auditory trick called the Shepard tone illusion to make it sound like the notes are constantly escalating in pitch. Yeah, I still can’t quite wrap my mind around it, but it’s magical! It is like a barber pole. I was gonna say one of the drawn stair loops. I think that snap wasn’t floor. It was Skarva’s sanity snapping entirely. It’s time for a surprise miniboss! Really? Now i’m gonna listen to that song. That was suppose to be a reply to the endless staircase comment. That is also a good song I should listen too! I love the pose our lady pirate’s striking. Might as well enjoy the free fall! Well, there are two, but I assume you mean the one that looks like she’s kickboxing The other is just kind of… fetal. I see a rage induced magical surge approaching. The exasperation is so great, it causes a shift in the spacetime and just evaporates everything. The fall puts them back at the start of the staircase, of course. And they take 1/2 a heart of damage. 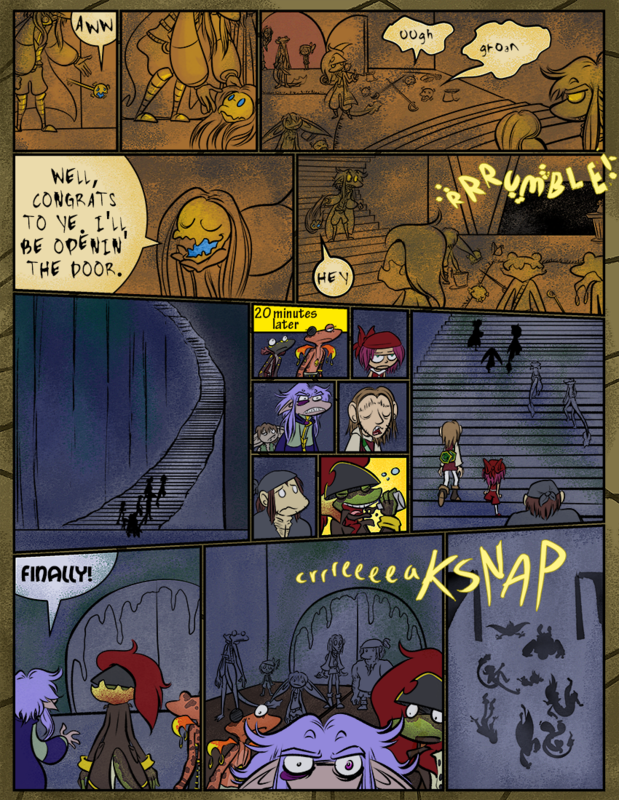 For full effect, read the second half page 5 times, as they forget about the trap.